There was a point when tablets had filled every space in the group with consumer having a wide choice but over a period of time, the markets began splitting. An image had been posted by Twitter account OnLeaks run by Steve Hemmerstoffer, the site editor for Nowhereelse.fr, a French news site which has posted various reliable leaks in the past regarding Apple’s earlier iPads prior to their release. Should his blueprint tend to be accurate, the upcoming launch of the 12.9 inch screened iPad Pro would measure about 12 x 8.7 x 0.2 inches. It would be larger than the iPad Air 2 with regards to length and width where the iPad Air 2 is 9.4 inches long and 6.6 inches wide though it is just slightly thicker at 0.28 inches thick as against 0.24. The blueprint of Apple’s rumoured iPad that was leaked online, portrayed the tablet’s full dimension with an idea on what it could look like. 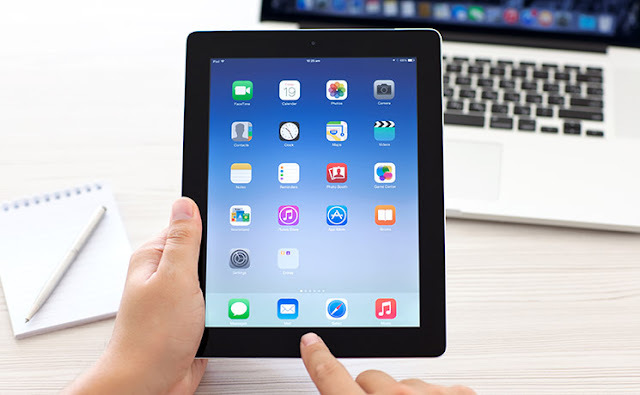 He notes that though the blueprint dates back to December 2014, there could be a possibility that it could be out-dated and is not sure till Apple discloses about its next iPad which normally occurs in October. Besides its larger screen and thinner frame, the next iPad is said to have a second port as indicated in a leak from Dutch blog VandaagApple. Rumours regarding the larger iPad has also revealed the inclusion of a stylus and would be probably introducing split screen multitasking within iOS, a feature which according to some was what Apple was striving to debut with iOS 8. If the reports, rumours and leaks that have been circulating seem to be true, then this would be Apple’s largest iPad so far. It would probably be more appealing for enterprise use cases, a motivation which Tim Cook; Apple CEO had been speaking in the past. The iPad Pro’s bigger screen would be in an improved position in competing with the other tables which have been optimized for productivity such as Samsung’s Galaxy Note Pro as well as Microsoft’s new Surface. Apple’s next tablet will be having a number of changes over its earlier models. Beside the larger screen size, the addition of Force Touch to the UI will enable easy access to extra options as well as settings while using application. The rumoured use of a digital stylus will support the creative process on the large screen. When the tablets had first been introduced, computing landscape was very much different from what it seems currently. The main factors of mobility were reliance on laptops in doing significant portable computing jobs and smartphones with a four inch display was used for communication and connectivity. From these it went to a nine or ten inch screen the first generation tablets were shipped with, inclusive of the original iPad and the distinctive advantages in portability as well as screen size which a tablet could offer became clear. While Android smartphones hold the majority of the market share – 82%, most of the success is around low margin devices. Though Apple’s iPhone may not have the overall numbers, it tends to commands more profit per handset setting up Apple in gaining much of the profit from the smartphone ecosystem. If Tom Cook together with his team could perform an identical strategy in the tablet field in creating a high end device like the iPad Pro, it could draw the bulk of the profit from it and leave the low margin/high volume commodity game to other manufacturer.